Consider this premise: Every business problem can be traced to a communication breakdown. Communication breakdowns might include lack of information, wrong information, mixed messages, no response, slow-moving information, etc. I’ve tested this and found it to be accurate. So what? It means internal communications can, and should, help solve business problems. To do so, internal communication practitioners need to shift their function (and mindset) from that of a line-item cost to value creation, producing measurable business outcomes. In doing so, they will earn their spot as invaluable contributors at the proverbial table. If you consider a business problem to be any situation resulting in financial loss to a company, or an obstacle to increased revenue, you can appreciate that a solution to such a problem will create financial gain. So how does an internal communicator rise from the traditional role of producing outputs (company-wide emails, intranet content, e-newsletters, executive videos, etc.) to one where she/he is influencing performance outcomes? This role redefinition is not without challenges, but the guidelines below address how to respond to those obstacles while building a reputation as a value-creator within your organization. In short, it requires a transition from internal communications to performance communications. Traditional communication channels may continue to be part of the solution, but the measures of success change to operating and/or financial improvements versus opens, views, likes and other communication responses that don’t directly correlate to business performance improvement. A few progressive practitioners already have transitioned, but the majority of internal communication functions can benefit from this four-step guideline addressing the most basic tenets of Performance Communications. 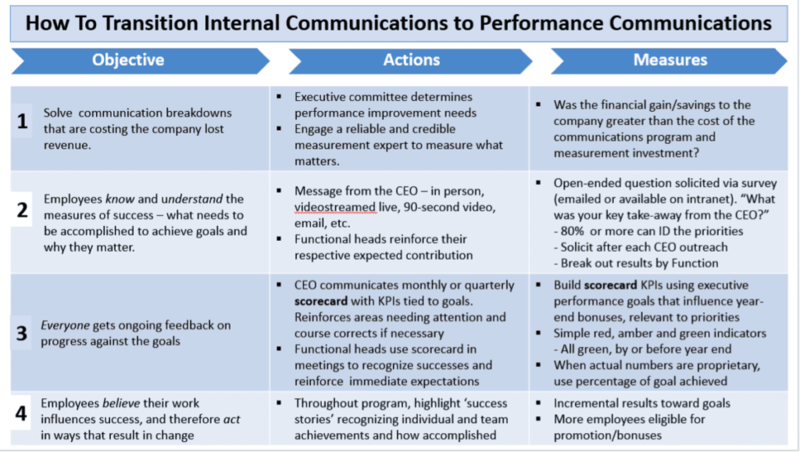 Four steps to transitioning internal communications to performance communications are outlined in the chart below. The most essential element in performance communications is the scorecard, or what many refer to as a dashboard. What differentiates this scorecard from many others, though, is: 1) it’s availability to all employees, versus being closely held within management ranks; 2) CEO ownership of the scorecard (with help from communications); 3) consistent reinforcement of the organization’s strategic priorities through its use; and 4) meaningful measures of financial and operating performance communicated clearly so that all employees understand the effort needed to achieve goal(s). Join measurement experts from SAP, Comcast, General Motors, Cleveland Clinic, Aetna, Adobe, the United Way and more at PR News' Measurement Conference April 16-18 in Philadelphia. Not all communicators have measurement expertise, which is why collaboration with a measurement pro is recommended. Use the leverage of that professional to elevate the importance and requirement for timely receipt of appropriate financial and operations data from internal sources, for inclusion in the scorecard. Following the CEO’s presentation of the scorecard, it becomes the basis for functional, departmental or site meetings. 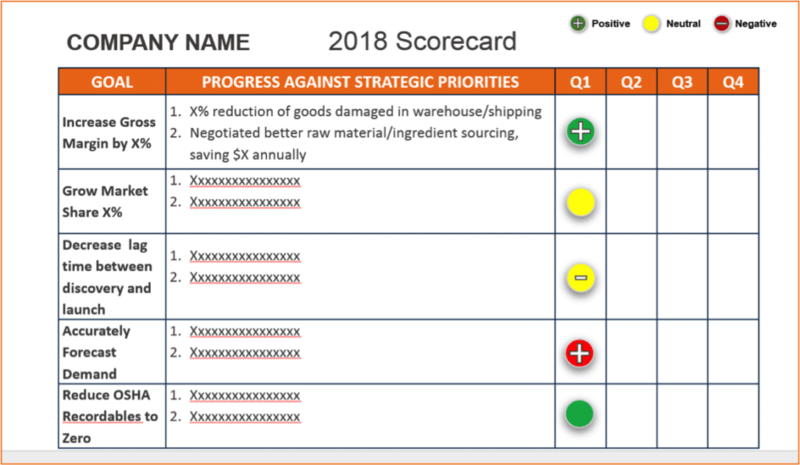 Company leaders can, and should, use the scorecard to provide additional context around how their respective organizations helped achieve specific goals, or where they need to step up effort. Finally, engagement of the CEO in communicating the scorecard increases executive interaction with the internal communications function. But that’s just the beginning … when scorecards are turning green and business performance is improving, CEOs and others in the executive suite will be seeking communicators who can help spot communication breakdowns and bring solutions – value creators. Mary Miller is a member of the Institute for PR's Measurement Commission.